At a UNE College 'Living' is just as important as 'Learning'. We have a range of ways in which you can explore your full potential. The following links provide just a taste of what your College has in store for you. UNE aspires to develop students to be critical thinkers who contribute to society in their local region or on the global stage. A critical aspect of UNE's Residential experience is to build this sense of place and participation within the wider community. Accordingly, all UNE Colleges have active and important programs that generate funds or otherwise contribute to community or charity organisations. Residents are actively encouraged to design or participate in community-focused activities for which they have a passion. Some examples of organisations that UNE Colleges actively support are Children's Medical Research Institute, CanAssist, the Cancer Council, The Arrow Bone Marrow Transplant Foundation, The Australian Red Cross Blood Service, Buy-a-Bale, and many others. Sharing your living experience at university is the foundation on which friendships are built that will last a lifetime. 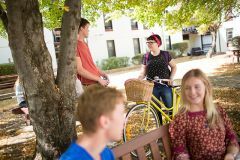 A balanced and healthy social life is a key part of life within a UNE College. Throughout the year you will have the opportunity to attend a number of social functions, both at your college and within the University community. These functions include themed parties held in college, formal dinners, barbecues, trivia nights, and the annual College Ball. Your elected representatives who make up the college Junior Common Room Committee manage many of these functions from Orientation to the end of the year and make sure there is plenty of chance for you to get to know your fellow residents. While these organised events are always welcoming and there will always be someone to go with, nothing is compulsory. If you would prefer a quiet night in, there are always common rooms available to watch movies or play cards with friends. Your college organises several formal dinners during the year, which all residents are expected to attend in formal attire or academic gown. These formal dinners promote the successes of the College in academic, sporting or community service endeavours and are important events in celebrating the tradition and heritage of the colleges. At UNE we pride ourselves on the quality of our sporting teams, not only because of their abilities, but also because of their sportsmanship and easy going attitude. At the College level, we foster these attitudes through the institution of friendly sporting competitions held between the colleges each weekend. Every Sunday, our Colleges compete for the President's Trophy (Mens) and Mary Bagnell Trophy (Womens), by participating in a number of different sports including Soccer, Waterpolo, Ultimate Frisbee, Netball, Touch Football and many more. This competition is usually held at our on-campus facilities at SportUNE, which are rated amongst the highest in the state. During this time you will meet people from other colleges and enjoy some friendly outdoor activity. For students passionate about sport, there are several UNE teams that compete in regional competition for sports such as Netball and Rugby Union. This may also lead to the opportunity to compete in the Northern and Australian University Games representing UNE. Whatever your interest level, there is always a chance to get involved and make the most of your time at UNE. The University has a rich cultural tradition linked to the local community and also to contemporary artistic developments. 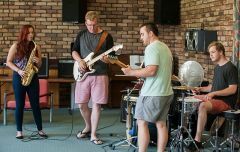 Our UNE Colleges are an incubator to develop this tradition and to support residents' aspiration to develop their talents in a variety of cultural endeavours. Each college expresses this in different ways, such as the Earle Page College Musical and college talent nights. In addition, all students are invited to come together to participate in a program of events under the banner of the Sir Frank Kitto (SFK) Trophy. Within the SFK program any resident will find an endeavour to suit their talents and interests - from Public Speaking and Theatre Sports to the Small Music Ensemble and Arts & Crafts programs. The SFK functions are always a delight for performers and spectators alike.